Civilized refinement through a contemporary lens, this unique residence set on a vast prairie with expansive views in every direction accommodates daily living while facilitating the owner’s passions for raising horses and collecting classic automobiles. A modern yet comfortable look prevails throughout resulting in spaces that are beautiful and enjoyable. To reflect the client’s request for a home that would take in natural light on all sides, Peabody’s designed the interiors to capture sunlight and make the most of the home’s expansive views. Living spaces are airy and open with minimal window treatments. Carefully chosen materials with a natural-color palette create a feeling of being in the surrounding environment. The open floor plan features a soaring double-facing fireplace which leads into a snug office den. Broad swathes of blue add softness to the restrained elegance of the monochromatic palette and contemporary surroundings. Touches like Oriental rugs and buttery leathers make spaces warm and welcoming. 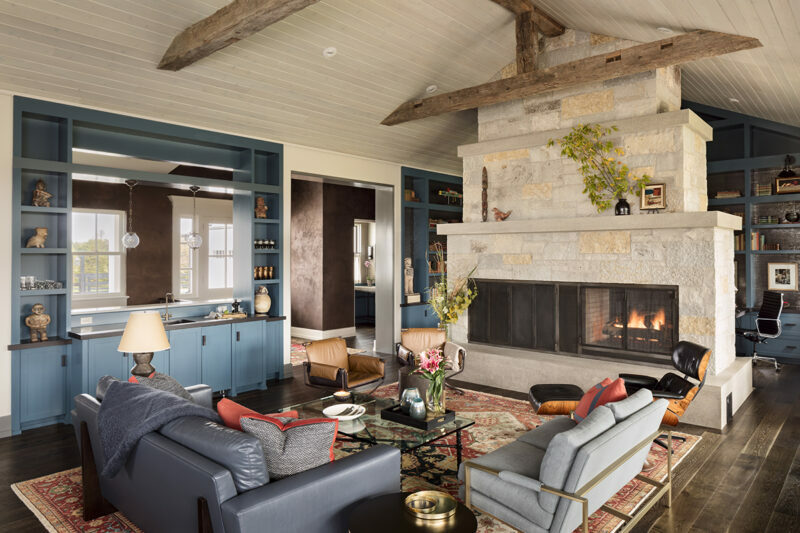 Painted cabinetry, barn-wood beams and upholstered walls serve as handsome backdrops for tightly chosen fixtures and furnishings like crisp glass pendant lights and iconic chairs. Rooms display favorite contrasts such as chocolate-brown leather against textured fabrics resulting in inviting layering. The lower level is a pristine showroom for a collection of rare automobiles. The side structures are outfitted to stable horses and house tools for micro-farming. Interiors so organic, so refined, so perfectly finished.